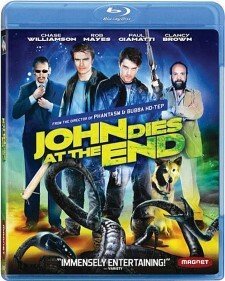 You may think you’ve cleverly figured out the climax of John Dies at the End (Magnolia Home Entertainment), but trust me, nothing at all is as it seems in this wild horror comedy from Don Coscarelli, the director behind Phantasm and Bubba Ho-Tep. Two friends get involved with a street drug known as “soy sauce,” only to discover that the substance is a key to another dimension—with some bizarre creatures on the other end of the portal looking to come to ours. Featuring Paul Giamatti, of all people, this one’s a colorful, bizarre romp that keeps the laughs and scares coming one after another. Also available: The legendary stoners made plenty of movies that felt like live-action cartoons, so Cheech & Chong’s Animated Movie! (20th Century Fox Home Entertainment) seems like the logical next step. A 30th birthday becomes the occasion for hilarious soul-searching in The Kitchen (Monterey Media), starring Laura Prepon (That ’70s Show), Dreama Walker (Compliance, Don’t Trust the B--- in Apartment 23) and Bryan Greenberg. One of the great pleasures of contemporary movies is getting to watch Isabelle Huppert act, so any film where she plays three characters can only be considered an embarrassment of riches. In Korean director Sang-soo Hong’s English-language debut, In Another Country (Kino Lorber), Huppert plays a trio of French tourists (a filmmaker, an adulteress and a divorcée) who all find love and complications while visiting a small resort town. It’s a breezy affair that the French New Wave directors would have totally claimed as their own. Also available: Speaking of French expatriates, the Luc Besson animated production A Monster in Paris (Shout Factory) arrives on these shores with an English-language voice cast that includes Catherine O’Hara, Adam Goldberg, Bob Balaban and musicians Sean Lennon and Vanessa Paradis. Werner Herzog is one of the few directors whose documentary releases generate as much excitement as his narrative films. Herzog (with collaborator Dmitry Vasyukov) returns with Happy People: A Year in the Taiga (Music Box Films), which takes us through 12 months in one of the world’s harshest and most remote regions: Siberia. Far away from civilization, the inhabitants of the town of Bakhta hunt, fish and trap in ways not all that different from their ancestors centuries ago, and this gripping film takes us through the year’s cycle, from the freeze to the thaw and back again. Also available: Two new documentaries, Last Shop Standing and Brick and Mortar and Love (both MVD Entertainment), pay homage to a beloved but rapidly disappearing facet of American life: the record store. Ken Burns’ powerful The Central Park Five (PBS Distribution) examines a case of injustice and mistaken identity that rewrites a shameful recent chapter of American history. G-Dog (Docurama Films) from Academy Award–winner Freida Lee Mock takes an inspiring but unsentimental look at Father Greg Boyle, a Jesuit priest who has lived in some of East L.A.’s toughest neighborhoods for the last 25 years, working to find jobs and new hope for gang kids. 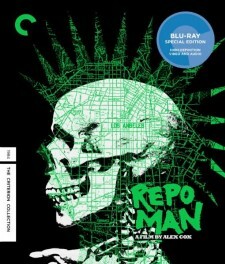 Even better than a plate of shrimp is the new Blu-ray of Repo Man (The Criterion Collection), Alex Cox’s punk-tinged comedy about aliens and classic cars. This stunning new Criterion release loads on the goodies, including a not-to-be-missed Iggy Pop interview, deleted scenes, a roundtable conversation with the film’s creators and, hilariously, the “cleaned-up” television version of the movie. Also available: No matter how Baz Luhrmann’s The Great Gatsby turns out, we’ll always have Strictly Ballroom (Lionsgate), now in a Blu-ray that makes Tina Sparkles sparkle even more. Barbra Streisand fanatics will kvell over the 4K restoration of Funny Girl (Sony Pictures Home Entertainment), and the completists will want the Blu-ray of Hello, Dolly! (Twentieth Century Fox Home Entertainment) as well. I’m all for the studios releasing everything in the vault, even decidedly lesser efforts like the comedies I Will, I Will… for Now and First Family (both Warner Archive Collection). Don’t let the cast (Bob Newhart! Madeline Kahn! Gilda Radner!) of the latter fool you, it’s very much an acquired taste. Newly minted Tony nominee Tom Hanks gets a Blu-ray (including director’s cut) of his behind-the-camera debut That Thing You Do! (Twentieth Century Fox Home Entertainment). Lastly, vintage action classic Zulu Dawn (Severin Films) returns in a snappy new edition. Shout Factory kicks us in the face with two of the greatest martial arts legends in the history of cinema. 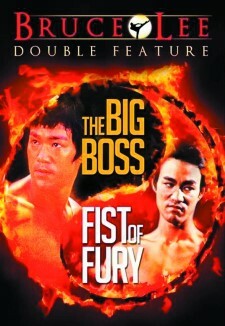 Bruce Lee Double Feature: The Big Boss and Fist of Fury and Bruce Lee Double Feature: The Way of the Dragon and Game of Death are basically chop-socky 101 for anyone interested in the genre (and necessary inclusions in any fan’s library), and Jackie Chan Double Feature: Police Story and Police Story II celebrates two terrific films from the man who would be Lee’s heir as the king of on-screen fighters. (If you’re a fan of Chan’s Supercop, that film’s American release was actually a retitling of Police Story III). Also available: Other martial arts masters kicking their way onto the Blu-ray scene this month are Donnie Yen, with the period piece Dragon (Anchor Bay Entertainment), and Jet Li as a monk with magical powers in The Sorcerer and the White Snake (Magnolia Home Entertainment). The whole idea of “British restraint” goes out the window when we revisit the classic horror movies from that country’s Hammer Films, and they don’t get much more wonderfully depraved than The Vampire Lovers (Shout Factory), a movie whose poster offers not one but two disclaimers: “Caution: not for the mentally immature!” and “IF YOU DARE… taste the deadly passion of the BLOOD-NYMPHS!” Another adaptation of LeFanu’s lesbian vampire novella Carmilla, this one offers a blood-sucking lady (Ingrid Pitt) and the male villagers (led by Peter Cushing) who want to destroy her. Fans of the 1970 version of the 18th century will love this one. Also available: Night of the Living Dead: Resurrection (Lionsgate) because, you know, zombies; Woochi The Demon Slayer (Shout Factory), a Korean hit about a centuries-old wizard more enraptured with 21st century ladies than with his duties of ridding the modern world of some nasty goblins. 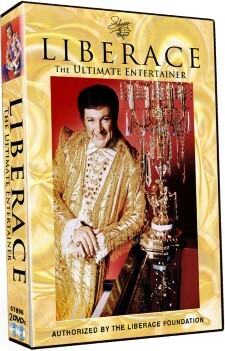 It’s admittedly hard to imagine at this point, but as the new release Liberace: The Ultimate Entertainer (Timeless Media Group; May 7) reminds us, the smiling pianist with the sparkly suits was a giant of 1950s television, getting the kind of audience numbers that today’s 500-channel universe will never see. Just in time for the eagerly anticipated Steven Soderbergh HBO biopic, this two-disc set features some of the outrageous performer’s greatest TV moments, complete with vintage guests like Jack Benny, Eva Gabor, Phyllis Diller and Minnie Pearl. Pop culture passed this way but once. Also available: If you’re a secret “brony,” or know someone who is, you’ll be snapping up My Little Pony: Friendship Is Magic — Princess Twilight Sparkle (Shout Factory Kids/Hasbro Studios). The self-explanatory Earth from Space (PBS Distribution) offers breathtaking views and insight onto our big blue marble. Nicole Kidman and Clive Owen generate a spark or two in the HBO biopic Hemingway & Gellhorn (HBO Home Entertainment).